Research Assistantship – I started working for a lab that is researching agent-based modeling of groundwater resources for use in the public sector. That’s a mouthful – and that was the shortened version. This job takes about 10 hours/week of my time, but in exchange, I receive a small stipend and a tuition waiver. That’s right, I don’t have to pay tuition. So worth it. Engineers Without Borders – I just got involved with this group for a project they are doing in Guatemala. They are working to install a new pump for their water distribution system. The project is an integrated effort among planners, engineers, and public health students. My work will involve taking a community census and I’ll be traveling with the group to Guatemala in January. For now, in my spare time – ha! – I’m writing a plan for the work while I’m down there and trying to develop a collaborative team with professors and other public health and planning students. Moving! Yes, we moved! When we found out our landlord was defaulting on her mortgage, we thought it best to try to find a new place to live that we liked rather than scrambling to find something passable when we get kicked out. We didn’t have a lease anymore, so we weren’t totally sure of our rights and just figured it be easier to start the long, drawn out search for a decent apartment in the summer/fall yet. And we did! We found a pretty neat space only 4 blocks from our old place. In that same week I had five assignments/papers due, plus all the other above stuff, Eric and I were busy packing all our belongings into boxes. Talk. about. stress. So we’re all moved in with just one shelf to put together and a few more pictures to hang. So far, we’re really liking our new place, and the cats are really enjoying running up and down and up and down our new stairs at night. Seriously. 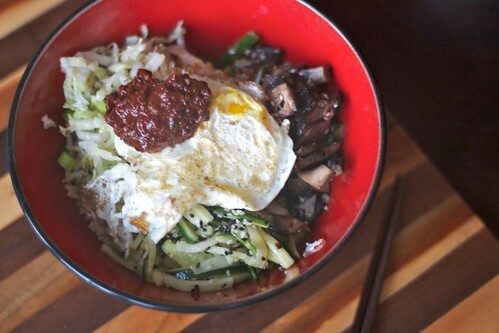 I made this bibimbap at the old place a number of weeks ago – before the craziness (see above) set in. 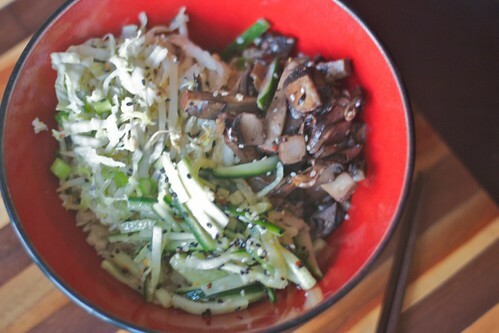 It’s not a very authentic recipe, which is why it is called Almost Bibimbap, but it certainly tasted good. For me, one of my favorite parts of a good bowl of bibimbap – a Korean dish of rice, veggies, meat, egg, etc etc – is the crispy rice that gets all crusted to the side of the stone bowl. This is hard to replicate at home, but I think I came pretty close with the method outlined below. Oh, and I made it vegetarian because that’s what Little Blue Hen did! 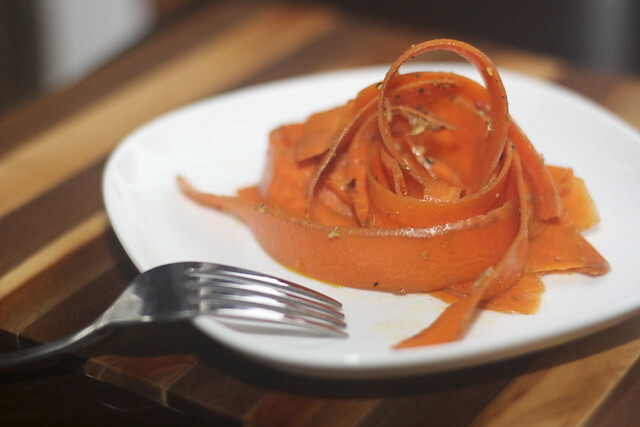 The Korean pepper paste – gochujang – is essential for authenticity. Try to pick it up at an Asian grocer or perhaps Whole Foods. Whisk together salt, pepper paste, rice vinegar, honey, sesame oil, and sesame seeds. Toss with cucumbers. Bring a pot of salted water to a boil. Toss in cabbage and bean sprouts and cook for 1 minute. Meanwhile, whisk together the other ingredients minus the salt. Drain the veggies and mix with the dressing. Heat the neutral oil in a pan and saute the mushrooms and garlic, adding more oil as needed. When the mushrooms are almost cooked through – they should reduce quite a bit in size – pour in the sesame oil and sesame seeds. 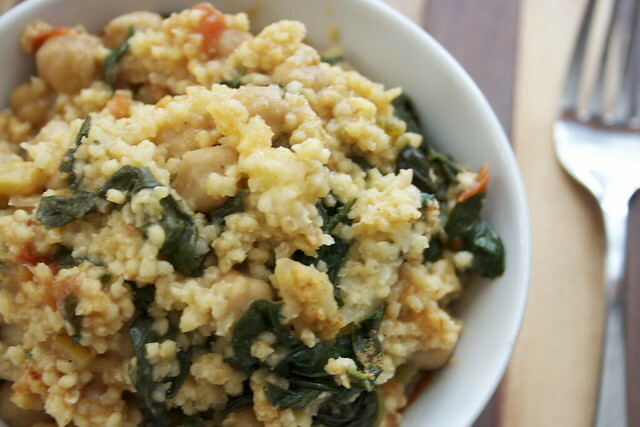 Cook the rice in a rice cooker or pan. Heat the oil in a pan and put the rice in the pan, packing it down. Let the rice crisp up on the bottom, then stir it around a bit and let it sit for a few more minutes. Work in batches like this until all the rice is nice and crispy. 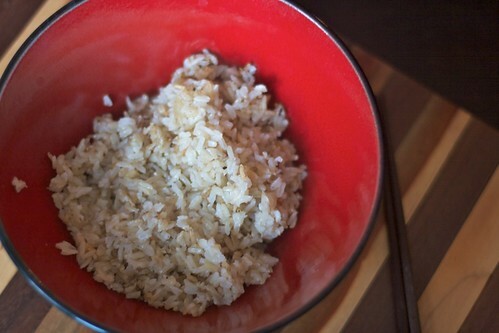 Divide the rice into bowls. 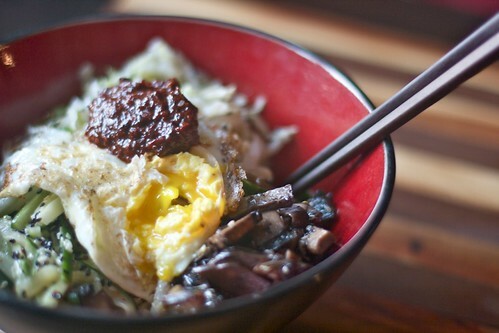 Top with each of the salads, and then top the whole thing with a fried egg – make sure the yolk is nice and runny. A big scoop of gochujang goes on top. 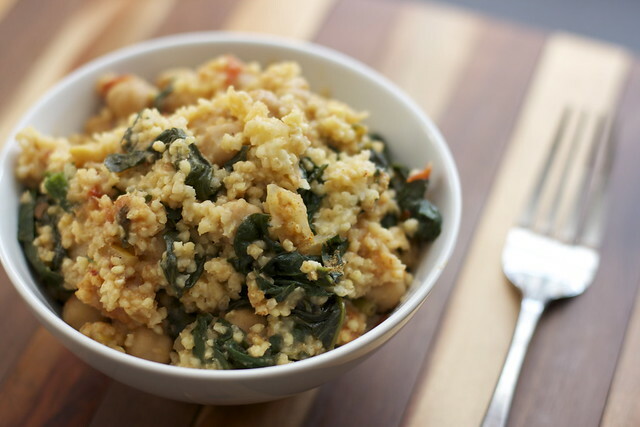 Serve like this, but mix it all together before eating!